The organic molecule iso-propyl cyanide has a branched carbon backbone (i-C3H7CN, left), unlike its straight-chain isomer normal-propyl cyanide (n-C3H7CN, right). Both molecules were detected with ALMA in Sagittarius B2. The discovery of a strangely branched organic molecule in the depths of interstellar space has capped a decades-long search for the carbon-bearing stuff. 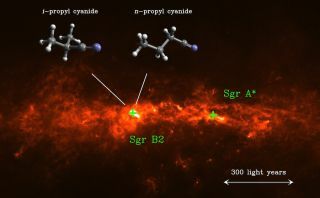 The molecule in question — iso-propyl cyanide (i-C3H7CN) — was spotted in Sagittarius B2, a huge star-making cloud of gas and dust near the center of the Milky Way, about 27,000 light-years from the sun. The discovery suggests that some of the key ingredients for life on Earth could have originated in interstellar space. Iso-propyl cyanide joins a long list of molecules detected in interstellar space. But what makes this discovery significant is the structure of iso-propyl cyanide. All other organic molecules that have been detected in space so far (including normal-propyl cyanide, the sister of i-C3H7CN) are made of a straight chain with a carbon backbone. Iso-propyl cyanide, however, has a "branched" structure. This same type of branched structure is a key characteristic of amino acids. "Amino acids are the building blocks of proteins, which are important ingredients of life on Earth," the study's lead author, Arnaud Belloche, of the Max Planck Institute for Radio Astronomy, told Space.com in an email. "We are interested in the origin of amino acids in general and their distribution in our galaxy." The central region of the Milky Way can be seen above the antennas of the ALMA observatory in Chile. Scientists have previously found amino acids in meteorites that fell to Earth, and the composition of these chemicals suggested they had an interstellar origin. The researchers in this new study did not find amino acids, but their discovery adds an "additional piece of evidence that the amino acids found in meteorites could have been formed in the interstellar medium," Belloche wrote. "The detection of a molecule with a branched carbon backbone in interstellar space, in a region where stars are being formed, is interesting because it shows that interstellar chemistry is indeed capable of producing molecules with such a complex, branched structure," Belloche added. It was first suggested in the 1980s that branched molecules could form on the surface of dust grains in interstellar space. But this is the first time such compounds have been detected. What's more, iso-propyl cyanide seemed to be plentiful — it was almost half as abundant of its more common sister variant in Sagittarius B2, the study found. This means that branched molecules could actually be quite ordinary in interstellar space, the researchers said. The research is detailed in the Sept. 26 edition of the journal Science.